Avid followers of our twitter feed will be aware that we are currently in the process of cataloguing the folios in our library’s rare book collection. We are about halfway through so far, and have made some interesting discoveries, including a few particularly rare and even unique items. 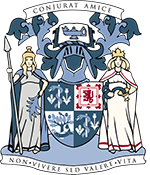 The most recent addition to the catalogue is an 1804 publication, The Parliamentary Records of Scotland in the General Register House, Edinburgh, Vol. 1 [1240-1571]. This is a rather unusual book, as it contains reports on the proceedings of the Parliament of Scotland, but is compiled from a selection of manuscripts in public custody, rather than from official Parliament records. It is therefore not an authoritative record of parliamentary proceedings, and it seems it was not actually meant to be published at all! C.P. Cooper’s Account of the most important public records of Great Britain (Vol. 2, 1832) explains that the lord clerk register of Scotland, Lord Frederick Campbell, had in mind an idea to publish Scotland’s historical parliamentary records, and he instructed his deputies (Mr Robertson and Mr Ferrier) in 1800 to prepare the first volume of what was intended to be a series. This volume, a hefty folio running to 824 pages, was printed at the Royal Press of Edinburgh in 1804, appearing similar in form and type to the Parliament Rolls of England. However its publication was seemingly suppressed by the Record Commission, and Cooper observes that only a few copies made it into circulation: “This volume, it is believed, has never travelled beyond the libraries of the curious.” This observation is corroborated by searches on Copac and Worldcat. Browsing through the volume, it is easy to see why the Record Commission attempted to suppress the work. The book is, to be frank, a bit of a mess, and while its contents are undoubtedly of historical relevance and interest, it has no rightful claim to being a genuine record of parliamentary proceedings. The records are not presented in any particular order (chronological or otherwise) and they are transcribed from the lawyers’ manuscripts almost word for word, meaning that many confusing and erroneous details have been allowed to creep in. In later years, between 1814 and 1875, Thomas Thomson and Cosmo Innes edited and published The Acts of the Parliaments of Scotland on behalf of the House of Commons. 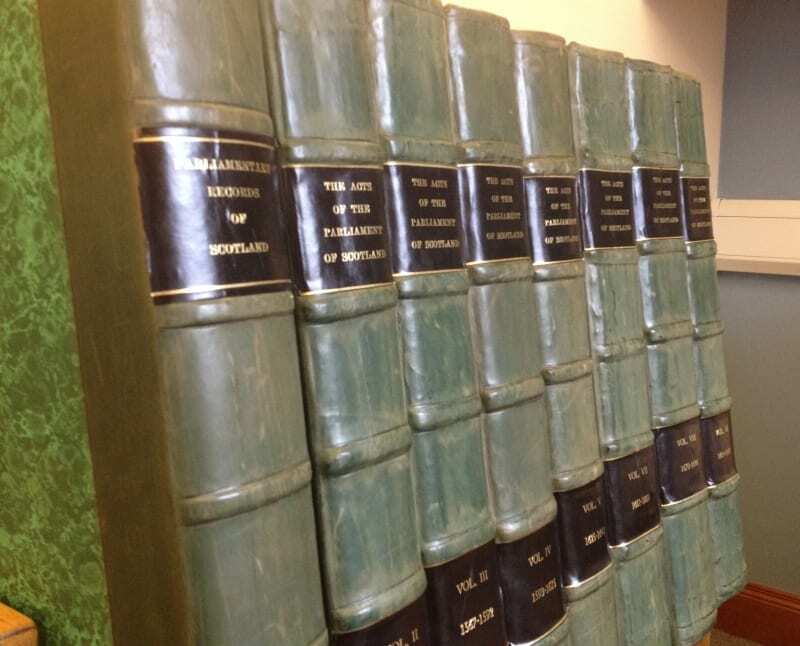 These 12 folio volumes were the most complete, authoritative and accurate records of the Parliament printed until that point, and they remain a valuable resource for historians today. The College Library holds an incomplete set of these volumes, which have been uniformly rebound with green leather spines and gold-lettered spine titles. Confusingly, Robertson’s single renegade volume from 1804 has also been bound in the same style, making it look at first glance like the first volume of Thomson and Innes’ much respected work.